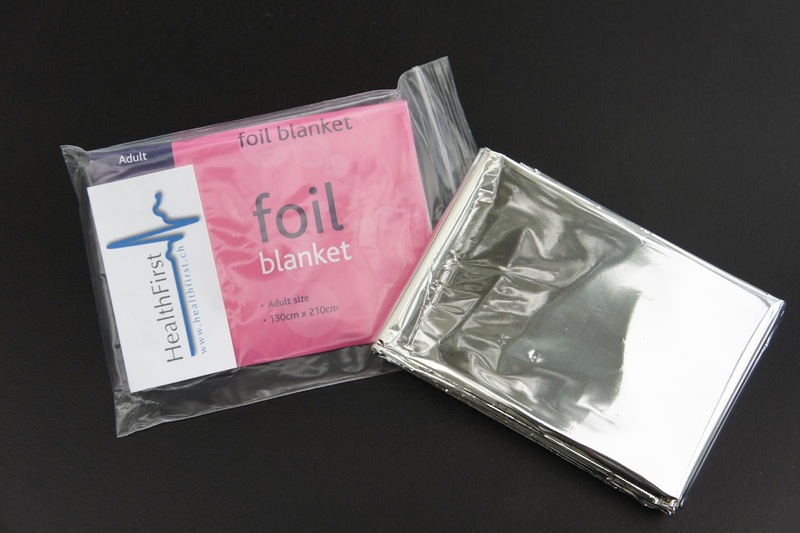 HealthFirst is pleased to launch our new Foil Survival Blankets and HealthFirst Resuscitation Face Shield Key Rings. These have been carefully researched to provide you with two simple, lightweight aids for your rucksack, handbag or First Aid Kit to enhance the First Aid care that you can give to your family, friends, colleagues or others. We have all seen them wrapped around trembling, triumphant marathon runners like the capes of a gilded superhero but what do they actually do? Our Foil Survival Blankets are thin, tough, waterproof, plastic sheets measuring 200cm x 130 cm – large enough to wrap around and cover a person. They fold up into a small rectangle approximately 11cm x 8cm and weigh only 50 grams. The fine metallic coating is specially designed to reflect heat and light energy. Wrap it securely around someone who is rapidly losing body heat, for example a runner at the end of a race or an injured hiker lying on the ground. The blanket will reflect the person’s own body heat back to them thus keeping their body temperature stable. Spread it out high above an ill or injured person to shelter them from the hot sun. The heat energy from the sun will be reflected back to the sky, providing their body with shade and UV protection. Cover the head and body of one or more people huddled under the blanket to shield them from rain and wind. Share your body heat with a person who is becoming hypothermic (a dangerously low body temperature) by keeping as much of your body in contact with their’s as possible. Then wrap both of you in the blanket to retain the heat energy. Lay the blanket on the ground to provide a clean, dry area for you and the injured person whilst giving them First Aid and waiting for the Emergency Services. 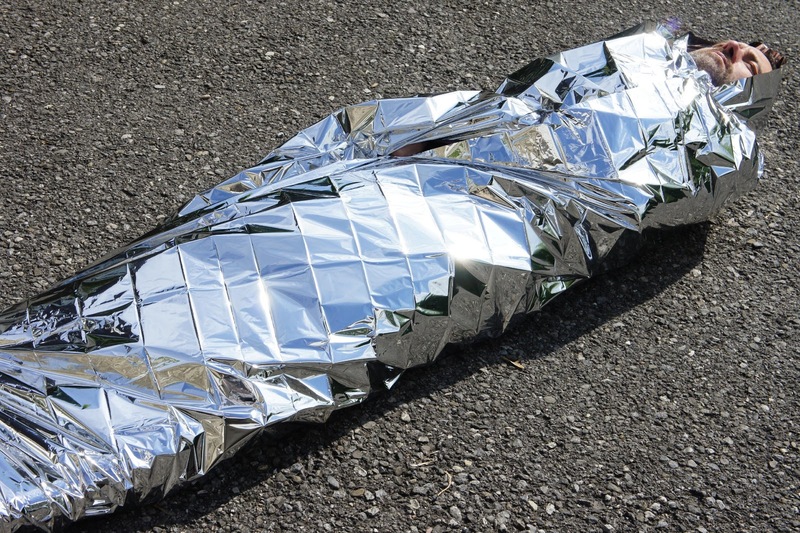 CLICK HERE to buy your Foil Survival Blanket now. Did you know that mouth-to-mouth resuscitation has been used to save lives since 1740? A person who has stopped breathing and whose heart is no longer beating needs urgent help to try to resuscitate them and bring them back to life. It is now known that as a bystander, if you give them repeated cycles of 30 chest compressions followed by 2 rescue breaths, their chance of survival can be doubled or tripled. Over the past centuries, medical science has continuously invented and refined the equipment and techniques used during Cardio-Pulmonary Resuscitation (CPR). Medical research has also advanced our knowledge of bacteria, viruses and other germs. It is only natural that, when faced with the prospect of giving mouth-to-mouth resuscitation, we can be torn between wanting to help a person and not wanting to catch any germs from them – particularly if that person is a stranger. For this reason, the Resuscitation Face Shield has been developed. Our HealthFirst Resuscitation Face Shield is simple to use and designed to cover a person’s face, nose and mouth whilst you are administering Cardio-Pulmonary Resuscitation (CPR) to them. The plastic, one-way valve placed over their mouth means that your rescue breaths are delivered to their lungs whilst protecting you from any viruses and other infections that they may be carrying. 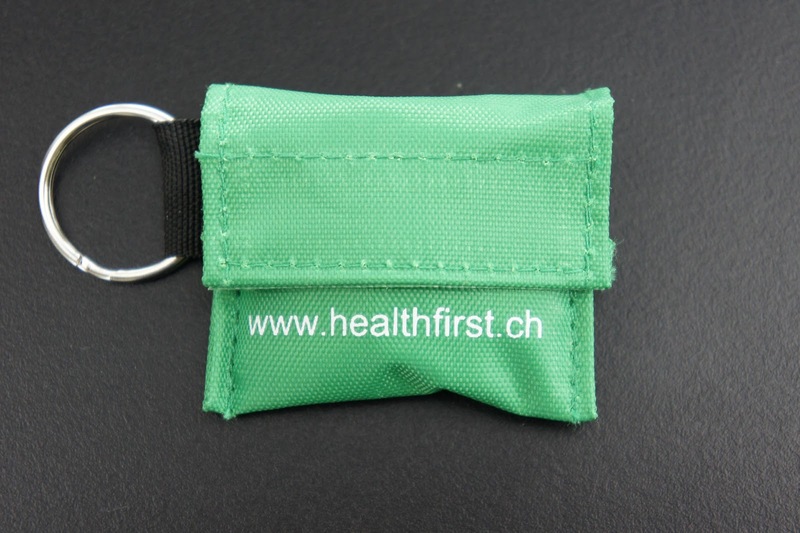 The Face Shield fits inside a handy key ring pouch and means that as long as your keys are with you, you will have quick and easy access to it. 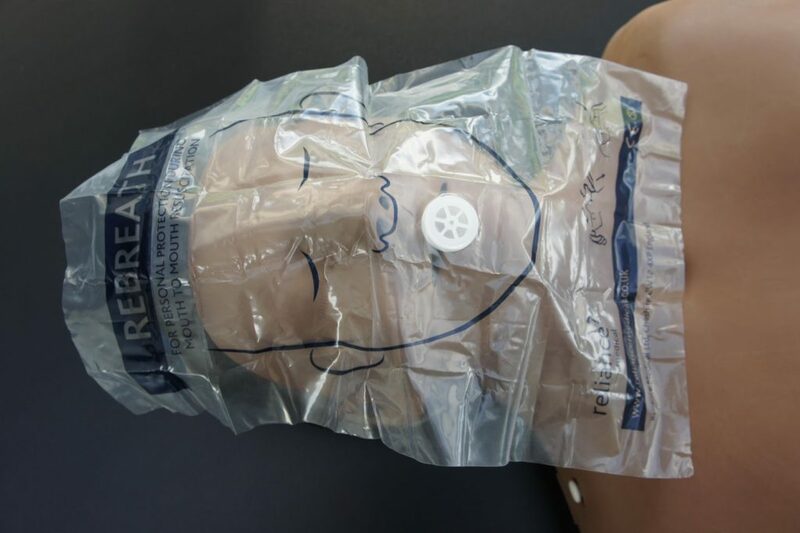 After lying the person on their back and giving them 30 chest compressions, remove the Face Shield from its pouch and open it out. Place the Face Shield over the person’s face, taking care to put it the right side up and to align the person’s eyes and nose with those on the diagram on the Face Shield. The white plastic valve is positioned over the person’s mouth. Tilt the person’s head back and pinch their nose closed through the Face Shield. Place your mouth firmly over their mouth, keeping the white valve between the two of you and making a tight seal around their lips. Blow gently out for 1 second, watching their chest rise. Remove your mouth and let their lungs passively deflate. There is no need to remove the mask. Repeat to give a second breath. Give 30 more chest compressions, followed by another 2 breaths and continue giving CPR according to the Basic Life Support protocol. CLICK HERE to buy your Resuscitation Face Shield Key Ring now. We are certain that with the knowledge in your head and these aids in your pocket, you will be confident and ready to help, wherever your day takes you.